Spoiler alert: This post contains information that gives away the Downton Abbey season 3 finale, along with other plot points of this latest season. If you’re trying to catch up on the craze and don’t want to know what happens, then stop reading (but come back to this post after you’ve watched the season finale because I want to know your reaction). I was late to the Downton Abbey party, and ended up watching the first two seasons through Netflix. I got hooked, like so many of my friends who loved to talk about Mary and Matthew and evil O’Brien and Thomas (the conniving servants we all love to hate). And so I was excited about actually watching a season along with my friends for a change and being able to talk with them about the developments as the season progressed. Most Sunday nights of late, one of my friends has posted on Facebook his favorite quote of the evening from the Dowager Countess (played by one of my all-time favorite actresses Maggie Smith). I usually recorded the show, and so I had to avoid Monday-morning commentary about the show so I wouldn’t learn any of the plot before watching it. But I have enjoyed the banter back and forth about the show and its characters this season. But this Sunday was my last episode. Writer Julian Fellowes has gone too far and killed not only a beloved character on the show but also managed to kill my desire to keep watching. On Saturday, The Miami Herald published an article about the season finale suggesting that only about a half dozen viewers didn’t already know about the shocking finale, but I knew there were more. I know at least five people personally who had no idea what was coming. Still reeling from a horrific death of one of my favorites on the show just three weeks ago, I didn’t want to believe that Fellowes would strike again so soon. But he did. Let’s talk about the body count surrounding pregnancies on the show: Lady Grantham (Cora) has a miscarriage in Season 1, losing the last hope of a son and close heir for Lord and Lady Grantham. Maid Edith gives birth to an illegitimate child, whose father was a soldier recuperating at Downton Abbey toward the end of World War I. The soldier/father dies, (though very few viewers mind) and, in this season, a now-tarnished Edith must give up the child to the rich grandparents to raise. Lady Sybil (the youngest and kindest of the three Crawley sisters) and chauffeur-husband Tom return to Downton where Sybil gives birth to a daughter before dying later that night in a heart-wrenching scene. And now, Matthew, as he was driving home on a beautiful sunlit country road, filled with joy at the birth of his son … well, did he have to end up under his overturned car? For those of you not counting, that’s four pregnancies and four deaths. Mr. Fellowes – you went too far this time. Why must someone always die when there’s a pregnancy on the show? I no longer want to know if Anna and Mr. Bates will become parents after Bates has finally gotten out of prison. I’m afraid if Anna ever becomes pregnant, a flock of crazed storks may attack her and Bates while they’re celebrating with over a sweet picnic. I don’t want to know what happens to O’Brien when somebody finally decides to pick up her story with “Her Ladyship’s soap.” And I don’t want to know if Carson and Mrs. Hughes ever get to live happily ever after. Because I don’t think Fellowes has it in him to let any single character live happily ever after. Facebook has been relatively quiet about Downton Abbey this week, maybe letting latecomers watch the episodes they’ve missed, or perhaps trying to process their feelings about how the season ended. But one of my friends referred to the show on Facebook as “Downer Abbey,” and that search term on Google turned up more than 8.5 million hits earlier today. Another friend asked if anyone else was tired of people having babies and then dying on the show, and so I know I’m not alone in my disenchantment with the show. One of her friends’ responses to her question did make me laugh, though, suggesting that PBS could have its shortest, most successful pledge drive ever by threatening to keep killing off beloved Downton characters until enough money comes in. So while I understand the bind Fellowes was in with two of his actors wanting to move on, I’m not up for another season filled with tragedy. I’m no longer willing to go along with the emotional manipulation of the show. Real life has too much tragedy of its own, and that’s what I hope to escape when I sit down to watch television on a Sunday night. Guess I’ll go back to reading on Sunday nights. And if I need to keep calm and ring for tea, I’ll fix my own cup. Carson would know this is a chocolate set, but it’s the closest I have to a fancy tea set. 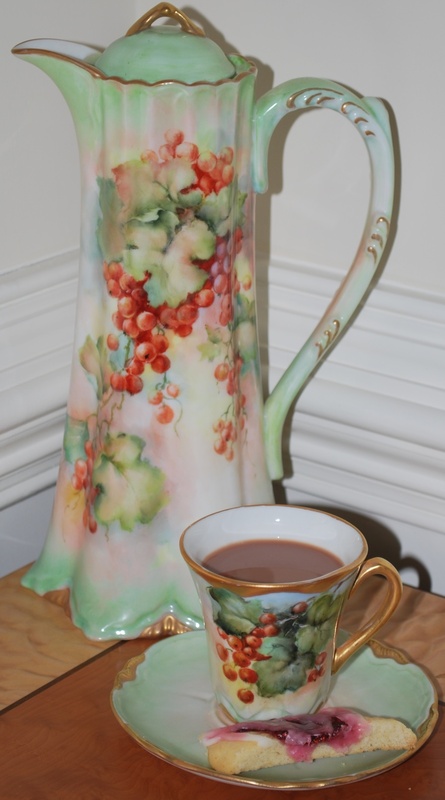 Knowing my preference for hot chocolate, my mother painted this set for me years ago. How about you? Are you a Downton Abbey fan or someone who can’t see what all the fuss is about? If you’re a fan, did this season’s finale change your opinion about the show? This entry was posted in flourishing tree and tagged Downer Abbey, Downton Abbey, Facebook, PBS, television by hopesquires. Bookmark the permalink. I am done too. In a nutshell, it got repetitive, boring and unimaginative. I don’t mind death of characters if it is done in an interesting fashion. Matthew’s death was just bad writing. They should have recast if they couldn’t come up with a better story. Just because random acts of death are true to life, that does not make it compelling television. If they could recast the lead character of Spartacus due to tragic illness and ultimately death of the actor, then there really was no excuse for Downton Abbey kiling off characters with random pointless plot devices. I am really late coming to this party but I watch Downton Abby with my wife and 20 year old daughters. Nice to spend time with them all. We just watched Matthew die (Amazon Prime) and I announced to my ladies that I AM DONE. I just had to search google and announce it to the world. I watch TV for enjoyment, not to be depressed. After Sybil that was just crossing the body count line. I know what you mean about crossing the body count line. But I also understand enjoying time watching a show your whole family enjoys. I’m still done, despite having read that this new season is more light and fun. I wonder how many of you who swore off the show last season have stuck to your promise now that the new season is airing? I just watched all three seasons on Amazon and all I can say is “yes, it is devastating because these characters become people you feel like you know” however, Downton Abbey is the best show I’ve ever seen on television. The story lines, the humor, the war scenes……. the actual real life history it incorporates into the drama…….simply the best. I cannot wait till January 2014. What a gift it was to be able to watch all three seasons back to back…….. it took me less than a week ! Oh…and Anna is my favorite character ! Looooove her ! Anna is wonderful, and she’s one of the characters I’ll miss by not watching. It is well written and fabulously acted. I hope you continue to enjoy it in the season ahead. I’ve been wanting to write to PBS about this third season. Am I the only one unhappy with the speed of the story lines? I felt as if Fellows zipped through them—especially the very disappointing wedding season opener that ended abruptly at the church! And why the mystery about Mary and her “medical” issue? I also agree that there were just too many meaningless deaths. PBS doesn’t have any control over the story line. It just picks up the show to air (and I’m sure generates huge positive publicity and fundraising abilities as a result). I have several friends who were disappointed by the non-show of Mary and Matthew’s wedding, and I think some of the season finale’s weaker story lines helped me decide to quit watching. But the writing — both compelling and weak at times — is exactly what drew me to the show to begin with and gave me something fun to discuss with other friends who watched the show. I fully expect to be the “odd man out” when next season starts. I am also a late comer, just now getting caught up. I am also distressed at the deaths but that said the characters are beloved friends now. And I would hate to see a flock of storks come down upon Anna and Mr Bates, but at this rate it might happen! It reminds of the Love Saga by Jeanette Oke, where it seems she kills off all the first husbands in each book. I can understand your frustration – but that said it is too early yet for me to say goodbye. I am sorry that your friends are going through so much. You got me thinking now, I wonder why I am being drawn into thinking of those characters as beloved friends…never did that before. Food for thought. My prayers are for you and your friends. Through Gods love may you be a comfort and encouragement to them. I think it’s human nature to be drawn to others, even if they’re fictional. That’s what inspires us to read books or watch t.v. and compels us to keep reading or watching, even when things start to seem more “real life” than real life. That is interesting, I never thought it that way. Must be why when someone is lonely they watch a lot of tv. Hope, I am a devoted fan. I love the human interactions and psychology behind it all. Lady Sybil was toughest for me- she was my fav! I think I had enough foreshadowing to be ready for Sunday pm. I will keep watching but if the writer fellowes leaves, I may exit. Haven’t given up yet- maybe I have a tougher heart than some….. We will have to talk about next time we meet- soon! I guess I didn’t want to see any signs of foreshadowing in this final episode, and that’s why it caught me off guard. I can’t imagine the show would survive is Fellowes walks away from it. Doesn’t he write and produce it? Looking forward to catching up with you. I started watching episode 1 season 1 yesterday. Now that I’m reading yours and others notes about all the tragedy, I don’t think I want to watch any more. I like all the classical time period books, I love reading about earls, dukes, dutchesses and that way of life in stories, but I don’t like tragedy. Good post, and beautiful hot chocolate set! Thanks, Katy. If you enjoy watching, keep watching. I enjoyed seasons 1 and 2 very much … and even some parts of this season (especially Maggie Smith’s show-stealing lines). I do love watching her as the Dowager Countess. Well, not every death on the show was related somehow to a pregnancy (the two family members who died on the Titanic and Lavinia Swire come to mind), but every pregnancy that I can think of does have a death associated with it. Thanks for the compliment about the chocolate set. My mom is a gifted china painter, and I treasure the pieces she has painted for me, including this set.